In this article we will learn about how to make a well stuctured and attractive presentation, analyze the goals and objectives of the presentation, as well as identify some of the main errors in the design of presentations. How to start creating a presentation? Templates or layouts, what to choose? There are many different types of presentations: business presentations, school presentations, event presentations and much more. We are not going to go into detail about each type of presentation, but will focus on the general features. The goal of any presentation is to communicate the necessary information to a certain audience, and the task is to do it as efficiently as possible. To do this, you will need a clear and consistent presentation structure. Before starting the design of presentation you need to prepare the content for your slides: Firstly, prepare the text in a text editor, like Word, for example. Then, define the main themes which you are going to place on the slides. Only a small amount of text should be placed on each slide, marked with titles. Remember that the visual part of presentation (the slides) is there to compliment your speech, highlighting only the most important points you are making. Finally, identify the necessary drawings, photos or graphics for the presentation. Learn how to find suitable illustrations in our article "Images selection". What is better? Creating a new presentation or using templates and layouts provided by many default editors? To answer this question, let's understand the difference between a template and a layout. The template is a fully designed slide, where you need to replace only the text and pictures. The advantages of the template is the speed of creating presentations. The flaw is the fact that, as a rule, the template does not fully meet your design requirements, as you are likely to want to do something differently, which can take more time than creating a new design. Second, all the templates are very standardized and not exclusive, so many people are pretty familiar with them. Therefore, a presentation created on a template program such as Powerpoint is not going to be original and isn't going to distinguish you from the mass of similar presentations. The layout is the structure of the slide, without a design. 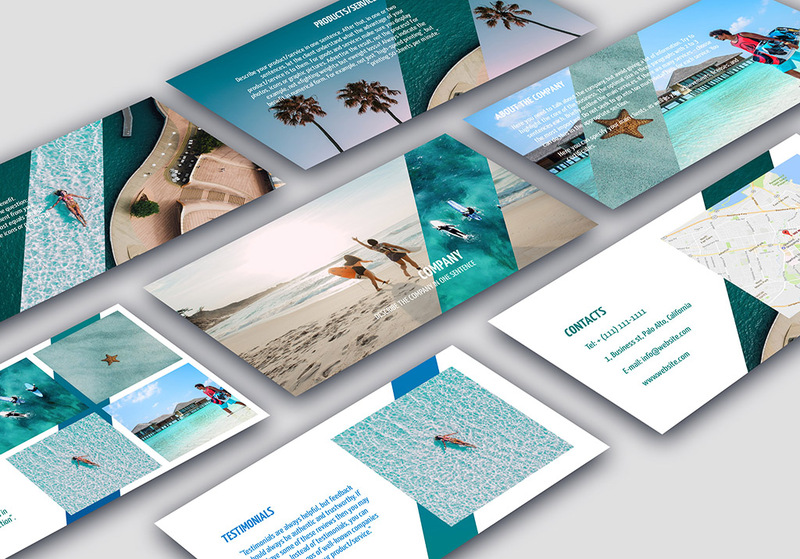 The use of layouts in the presentation, in our opinion, is more justified, as the layout will help you to choose the desired structure, and show a little creativity, decorating your presentation to your own taste and style. In conclusion, if you are a beginner and do not have experience in creating presentations, use the template, especially if speed is more important than design. However, if it is important to create a more image based presentation then use a layout with your design. The Wilda online builder presents both layouts and designed templates on various themes, which you can easily find in your personal account. If you have a non-standard presentation, and standard layouts or templates are not suitable for it, then create it from scratch. You can use our tips to help you.